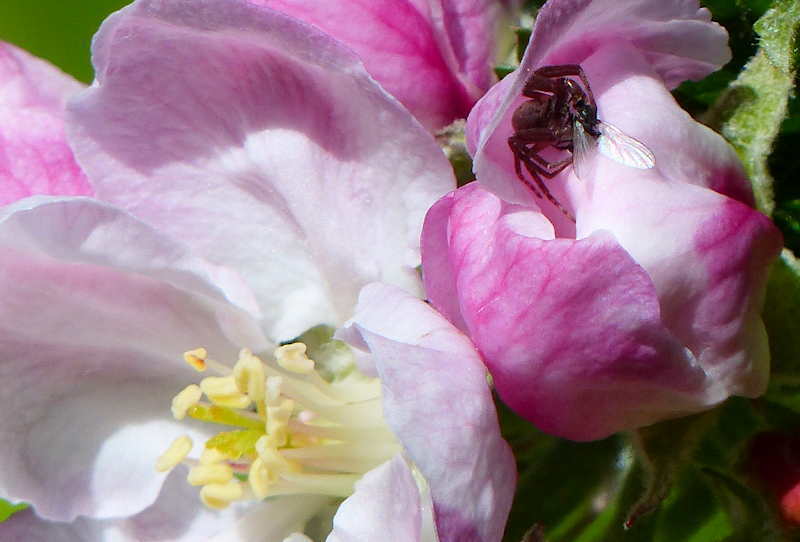 On seeing soft pink apple blossoms in my mini orchard meadow open in warm spring sunshine, I am dreamily taken back to memories of my childhood. 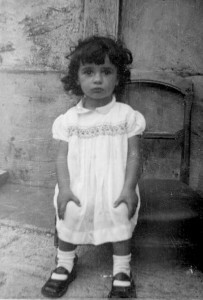 It was an idyllic, nature connected childhood which started as soon as I was able to walk, as you can see by the muddy fingerprints on my beautiful white dress which had doubtless been spotless when my mother had put it on me that morning. I was constantly playing with the mud, or sitting in the garden playing with woodlice, or watching butterflies and other wildlife that I found there. You can see that I was outdoors a great deal by my very tanned face! When I was about 5 years old, my father showed me a butterfly chrysalis in the garden shed and I was fascinated. It was simply magical! How on earth did that transform into a butterfly, having started as a caterpillar? He also found a toad underneath the garden path and I loved its rather dour, resigned expression at having been found as it retreated from us. My mother taught me the local names of the many wildflowers and butterflies that we spotted in grass verges on local walks. She told me that when she was a young girl there were ‘clouds of butterflies’ as she walked along the wildflower meadows and due to my surprised, quizzical expression, she assured me that it was not that she was looking at life through ‘rose-coloured glasses’. I have since read of others reporting the same experiences in the 1930’s and 40’s. It was in the years before pesticide use began and the steady loss of wildflower meadow and hedgerow habitats due to changes in farming practices. When I was taken to my grandmother’s house which was nearby, I loved to be in her orchard meadow in spring. 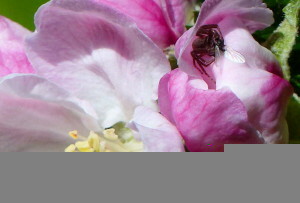 I delighted in its apple, pear and plum trees looking like a fairyland due to the abundance of blossom, the air filled with the sound of the buzz of pollinating bees in the spring, chirring grasshoppers in the summer and butterflies visiting the many wildflowers there. The fruit was there to be eaten when ripe and to make delicious jam. Absolutely no lessons needed about where fruit or jam came from. It was happening right in front of my eyes. At school we had a Nature table where we learnt about tadpoles, sticky buds, different types of trees and insects. We were also taken on Nature Walks. My walk to school took me past a chalk stream where I loved to gaze at the hypnotic Water Crowfoot. Cars were owned by few people in those days, the local doctor was one of them, so children were very much aware of Nature and her seasons during their walk to school. Our village green was grazed by a goat which was tethered, so that it could only graze one part of the green at a time. This left portions of the green with wildflowers for visiting bees and butterflies. When we had our school photo taken, the mat was placed by stinging nettles which were most likely left because it was realised that butterflies laid their eggs on them. So their foodplants were not cut down and tidied away, as we unfortunately tend to do nowadays to grass verges or unused green spaces. I was encouraged by my mother to venture out on countryside walks on local farmland with my sister when I was about 8 years old. It was on these walks that I saw my first water rat (as water voles were then known) in our babbling, crystal clear chalk stream, and a harvest mouse sat on its nest which had been woven around wheat. A child immersed in Nature is going to grow into an adult who realises that they are a part of Nature and are dependent upon thriving ecosystems for their survival. Nature is regarded as kith and kin: as fellow beings to be treated with respect and reverence. When birds such as nightingales migrate to another country, having spent the summer here, it is inconceivable that their all too rare habitats which they return to each year could be destroyed. 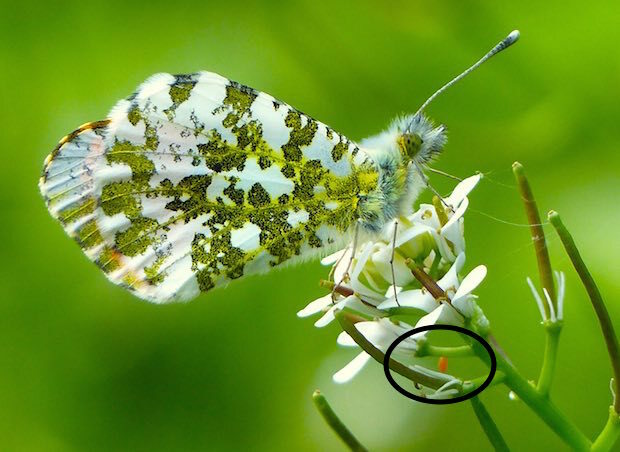 I am bought back to the present moment by the delight in seeing a male Orange-tip butterfly land to sup nectar from Garlic Mustard. I run indoors to grab the camera! The temperature changes and cools, so it stays for longer than I had hoped, as you can see in this short clip. 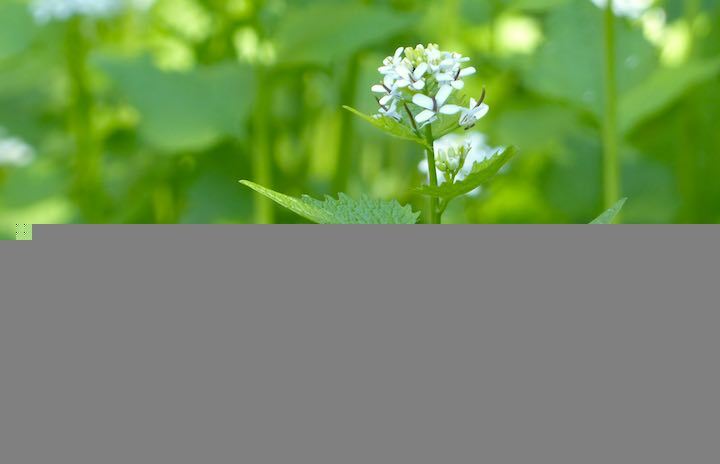 A week passes and I am delighted to find a tiny Orange-tip butterfly egg on Garlic Mustard in the orchard meadow which I noticed before the butterfly (a male) due to its excellent camouflage. The males have orange on the inner wings but this is barely visible when the wings are closed. The female does not have any orange at all, so can be difficult to tell from a Small White and Green-veined White when in flight. My three year old grand daughter recently said, “Butterflies are like flowers, aren’t they Nana?” when she was shown her first Orange-tip butterfly. It was such a heart-warming observation of beauty upon beauty and was an echo of my childhood experience. 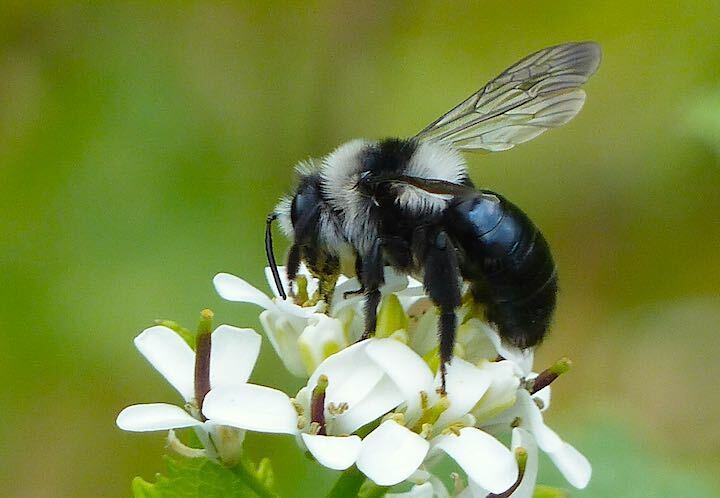 Then another visitor arrived to sup on the nectar of this plant: a beautiful, solitary Ashy Mining Bee. 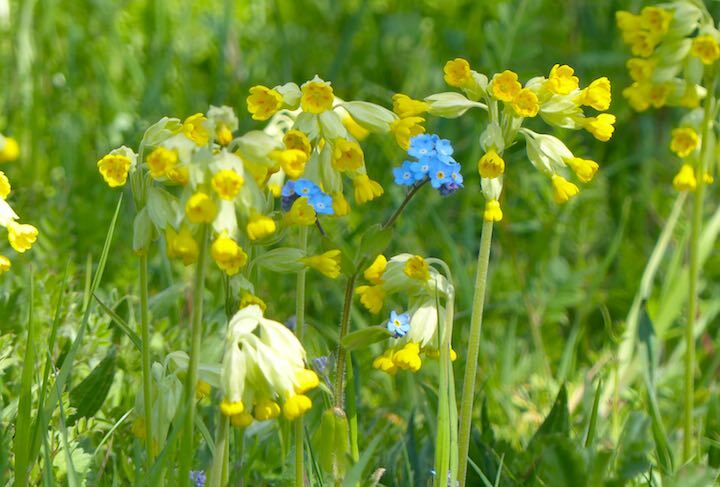 I have been enjoying the Cowslips on the mini wildflower meadow for a number of weeks now. But much to my surprise, as I was struck by the beauty of their golden hued glow, a vibrant, kingfisher blue flower caught my eye amongst them. It was a Forget-me-not and my father’s favourite flower in his lifetime. So it is especially welcome! It is clearly important to have parents and grandparents who offer wildlife habitat and who also interest their children and grandchildren in wildlife, so that they will in turn care about their well-being. Consequently, I make sure that I spend time with my grandchildren to introduce them to the joys of Nature. It is so heart-warming to see their fascinated faces full of wonder and their delighted smiles. We hope that you will tell us your stories of your projects for Nature with your children and grandchildren and send us your photos on Twitter and Facebook.